Mug made of ceramic stoneware. 3.5"Dia. x 4.5"T; holds 16 ounces. 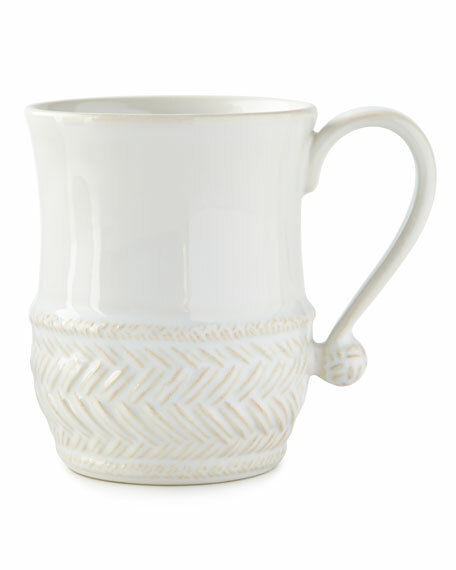 Mug crafted of hand-sculpted white porcelain. Mustachioed on one side; full-lipped on the other. 3"Dia. x 4.5"T. Microwave and top-rack dishwasher safe. Imported. Stoneware mug with porcupine/raccoon design. 4.8"W x 3.5"D x 4.8"T. Hand wash. Imported. Mug handcrafted of enameled 12-gauge steel rimmed in bronzed stainless steel. Hand-painted Courtly Check® design. Dishwasher safe; hand washing recommended. Mug handcrafted of enameled 12-gauge steel rimmed in bronzed stainless steel. Hand-painted Courtly Check® design. Dishwasher safe; hand washing recommended. 4.25"Dia. x 3.5"T; holds 16 ounces. Imported.